1 - 3 $29.95 ea. 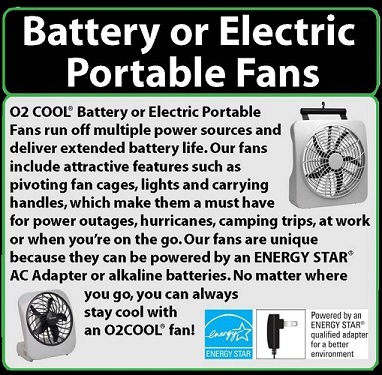 The O2COOL 10-Inch Battery or electric portable fan is perfect for outdoor activities, use in a hot office/school, and especially useful in emergency power outages. O2COOL\xCDs fans include a range of sizes, multiple power source options, patented fan blades for efficient operation and compact designs that allow you to take the cool anywhere you want to go. Dual Power sources: Plug-in with the AC adapter (included) or use 6 D-Cell batteries (not included). OPERATING INSTRUCTIONS For best performance use fresh alkaline batteries. To install batteries, position the fan in an operating position. Using a large coin or sc rewdriver , rotate the battery door lock screws _ turn to the marked \xF1unlock\xEE position. Remove the battery cover by first lifting on the large tab. You will need to reposition your hands multiple times around its shape to release the snaps holding the cov er. Install batteries following (+/ - ) marks. Replace the battery cover and snap it in place. Using a large coin or screwdriver , rotate the battery door lock screws _ turn to the marked \xF1lock\xEE position. To operate, slide switch located on front of fan. 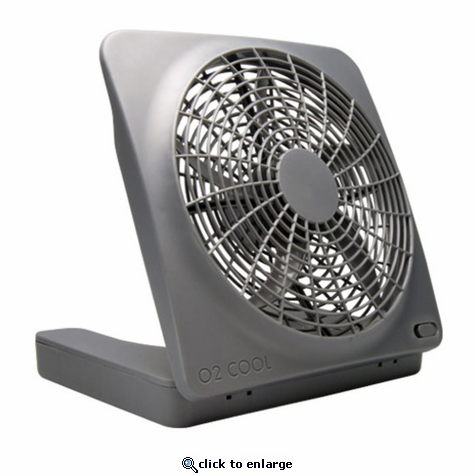 T o operate fan using AC power (120 - 240 VAC, 50 - 60 Hz), use supplied adapter only. Inserting adapter plug into fan disconnects the installed batteries from the circuit. Remove batteries if fan will be stored for two weeks. i use these mounted to my tractors roll bar to keep me in a cooler state they work great ! Use this for home, camping, in the vehicle. It could be used wherever you need to move air or cool off. ProsLong running, high or low speeds, pushes a lot of air, very quiet, can be used w/wo ac adapter, will stand on its own or can be hung. Great for power outages. My wife and I just went through a power outage due to hurricane Matthew. 02 Cool worked like a champ !! Great Fan !! ProsPuts out air very well. ConsNo instructions included to install batteries.